The Department of Social Protection is advising people to get in touch with their offices tomorrow to schedule an appointment. 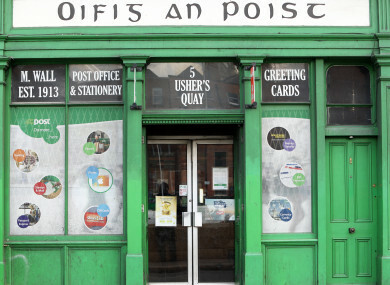 A post office on Ushers Quay, Dublin. A NUMBER OF Intreo Centres and branch offices are closed or only offering a limited service today due to Storm Ali. The Department of Employment Affairs and Social Protection have advised that people get in touch with their office tomorrow and reschedule their appointments. An Post released a statement this afternoon saying that its mail and post office services in the north and northwest of the country have also been affected. “Heavy winds and subsequent storm damage meant disruptions to service in more than 60 post offices while mail deliveries across a wide area of the North and North West were temporarily disrupted during the height of the storm,” it said. An Post is working to restore full services as soon as possible. A Status Orange wind warning was in place until 1pm today; a Status Yellow warning is now in place as Storm Ali sweeps across the country. Counties Cork, Kerry, Limerick and Galway were expected to be the worst affected. Winds are forecast to be strongest in the west and northwest with mean speeds of between 65-80 km/h and gusts of between 110-130 km/h. This morning, a woman’s body was found after a caravan was blown off the side of a cliff in Co Galway. Around 186,000 homes and businesses are without power due to Storm Ali; transport systems have been disrupted and people have been advised to keep an eye out for falling trees. Email “Some welfare offices closed and An Post services disrupted due to Storm Ali”. Feedback on “Some welfare offices closed and An Post services disrupted due to Storm Ali”.